I was angry at my husband. For no particular reason, either. There had been no fight. No unkind words. In fact, he’d been texting and Face-Timing me on a daily basis during the week we’d been apart. I was in Northern Wisconsin for two weeks while my son visited a nearby university. Over the past few weeks, it seemed a tiny resentment had slipped into my heart and taken root. Over something that my beloved was unable to do for me. UNABLE… not unwilling or uncaring… just unable. He couldn’t provide me with something I’d craved. My brain acknowledged his inability to do what I wanted. But my heart perceived this as a rejection. But discontent had been birthed inside me. Unchecked, it grew silently and unobserved. Until the day it caught me completely unprepared for the tornado of anger that surged up inside me. It knotted my throat, and tore at my conscience. So strong were these feelings! They made me anxious, desperate and defiant. I was resolved to never return home. A 47 year-old runaway. Really?!? Oh, thank God for faithful Christian soldiers! I was advised to pray and ask God for a vision of how Jesus sees my husband. To see Rey through the eyes of our All-Loving Lord. But… I didn’t WANT to see that vision! I wanted someone to affirm my anger – to throw gasoline on my fire of raging judgment (insert stamping foot here). And a humble request to see Rey through Jesus’ eyes. It took a few moments, but an image filled my mind. First, my husband was a giant Lego-Man-Warrior standing in the middle of a street. He was tall, imposing, and immovable. I giggled, because WHY would he be a Lego-Figure? I took another breath and asked God why the Lego-Husband wasn’t moving. He turned my attention to a little boy sitting on the bottom stoop of a city porch. He was 4 or 5 and hunched over his game of marbles and army figurines. The boy was looking down; trying to make himself small and invisible. Tears started sliding down my cheeks. Silently and without restraint. I wasn’t sobbing. There was no ugly-crying face… just an overfilling of emotion and compassion for this vulnerable boy. The defenseless version of my Lego-Man-Warrior-Husband. The final version of my husband that I saw was the one that Jesus sees. An adult. Warm. Flesh and muscles. Black wavy hair. Warm brown eyes that look directly into mine – unwavering and strong. This is my husband – fully realized into the man God created him to be. The man that can be, if I remain faithful to my role in his life – encourager, helper, steadfast friend. We are both on a journey – each of us at a different place on the continuum of reaching our true selves. I am not living in a fantasy with a mythical Prince Charming. I am married to a man that is not equipped to meet every need I have. No human is equipped to do that. There is only one… that is God. So I take another deep breath and thank God for these images. I am aware of a gentle weight and warm peace in my chest. The tornado and anxiety are gone. I am reminded how quickly an insignificant offense can become a foothold for the enemy to destroy a relationship and a family. And thanked God for delivering us from evil. Read DARE TO RESPECT to see how 6 fictional characters responded to their own husband-resentments. 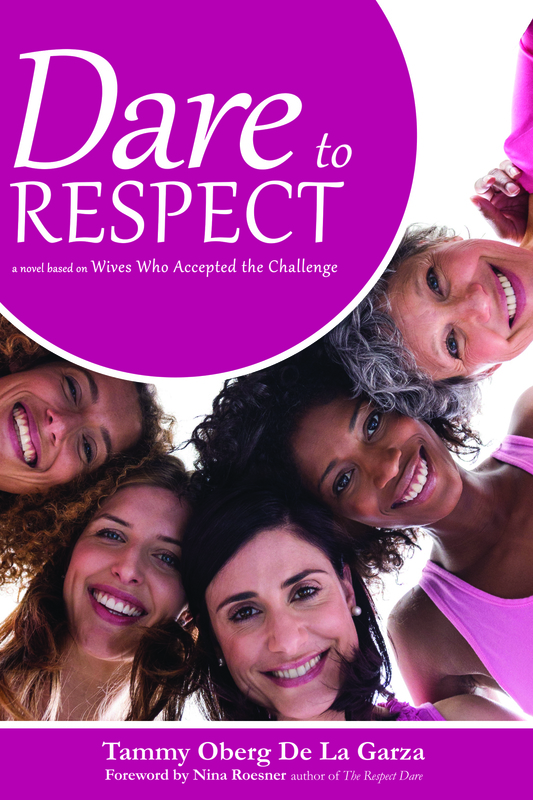 Start The Respect Dare with a small group of women who want a deeper connection to God and their husbands. These dares changed my marriage!